Importing the captured images to your Computer. USB Morse typeS is an easy connection to the USB port. 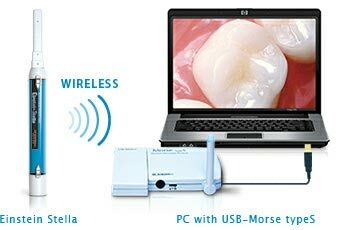 RF intraoral cameras wirelessly transmit the images to your PC through USB receiver. By using the software included in the package, the captured images are easily stored and managed, and useful to increase your patients' understandings. Dimensions (W/D/H) : 110 x 79 x 15 (mm) / 4.3 x 3.1 x 0.6"